Nottingham Industrial Museum are excited to welcome the artist Rachel Carter to the museum throughout May, June and July 2019. Visit her studio, next to the wood shop, to watch her in action and have a go at some craft techniques yourself. Rachel is an expert in traditional weaving, macramé, knitting and crochet techniques so is the perfect fit for the museum. And she has recently learnt that many of her ancestors were involved in the textile industries of Nottingham and the region, which we celebrate in our Textile Gallery! 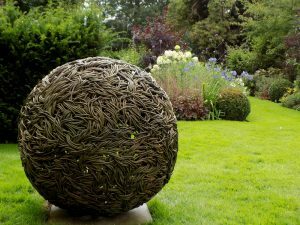 Rachel Carter has eleven years of professional experience, creating large and small sculptures which combine traditional techniques with modern materials. Her sculptural work often features abstract fluid or geometric shapes that take inspiration from the patterns found in nature. 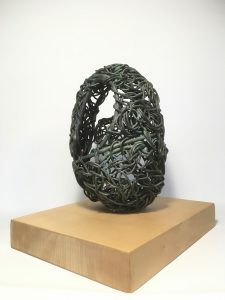 With each sculpture she applies hand weaving techniques to various materials such as wax, wire, paper and cord. Changing materials but applying the same process to it can vastly change the outcome, and it is this play with shape, form and texture that holds a particular interest to her. Rachel is joining Nottingham Industrial Museum for May-July 2019 for an Artist in Residency, where she celebrates her own family history within the wider regional context. The residency is part of a larger celebration of 400 years since the famous Mayflower ship set sail for America. From the museum, her project will progress as she ‘posts herself’ across the Atlantic in a freight ship, recreating the journey the pilgrims took on the Mayflower. Once in America she will be working with the Wampanoag Native American community, who first met the Mayflower settlers 400 years ago, and learning their own weaving techniques for use in her work.